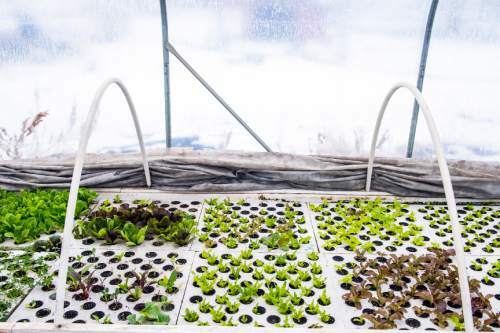 Chris Detrick | The Salt Lake Tribune A variety of vegetables growing at Deseret Peak Aquaponics in Grantsville on Wednesday, Jan. 6, 2016. Chris Detrick | The Salt Lake Tribune Kale and salad greens at Deseret Peak Aquaponics in Grantsville on Wednesday, Jan. 6, 2016. Chris Detrick | The Salt Lake Tribune Sandy Stapley looks over some of her plants growing at Deseret Peak Aquaponics in Grantsville on Wednesday, Jan. 6, 2016. 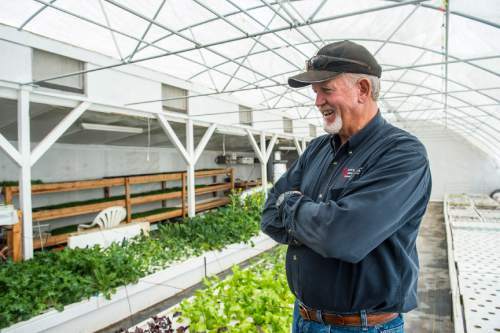 Chris Detrick | The Salt Lake Tribune Terry Stapley looks over some of his plants growing at Deseret Peak Aquaponics in Grantsville on Wednesday, Jan. 6, 2016. Chris Detrick | The Salt Lake Tribune Beet and mustard greens at Deseret Peak Aquaponics in Grantsville on Wednesday, Jan. 6, 2016. 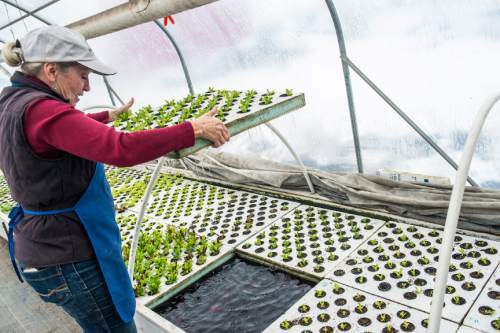 Chris Detrick | The Salt Lake Tribune Sandy Stapley looks over some of her plants growing at Deseret Peak Aquaponics in Grantsville on Wednesday, Jan. 6, 2016. Chris Detrick | The Salt Lake Tribune Scottish blue kale at Deseret Peak Aquaponics in Grantsville on Wednesday, Jan. 6, 2016. Chris Detrick | The Salt Lake Tribune Barley fodder used to feed alpaca at Deseret Peak Aquaponics in Grantsville on Wednesday, Jan. 6, 2016. Chris Detrick | The Salt Lake Tribune Barley fodder used to feed alpaca at Deseret Peak Aquaponics in Grantsville on Wednesday, Jan. 6, 2016. Chris Detrick | The Salt Lake Tribune Rainbow trout feed at Deseret Peak Aquaponics in Grantsville on Wednesday, Jan. 6, 2016. 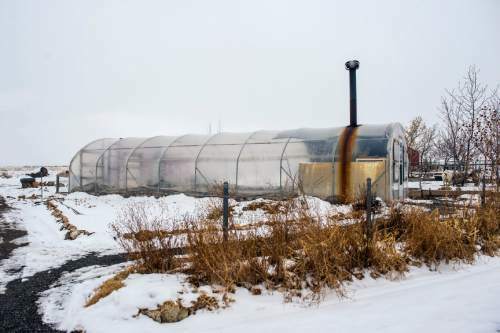 Chris Detrick | The Salt Lake Tribune One of the greenhouses at Deseret Peak Aquaponics in Grantsville on Wednesday, Jan. 6, 2016. 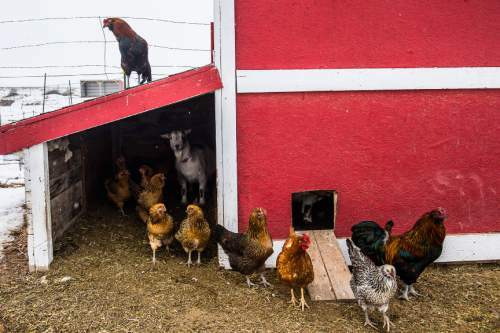 Chris Detrick | The Salt Lake Tribune Chickens and a goat at Deseret Peak Aquaponics in Grantsville on Wednesday, Jan. 6, 2016. Chris Detrick | The Salt Lake Tribune A variety of vegetables growing at Deseret Peak Aquaponics in Grantsville on Wednesday, Jan. 6, 2016. 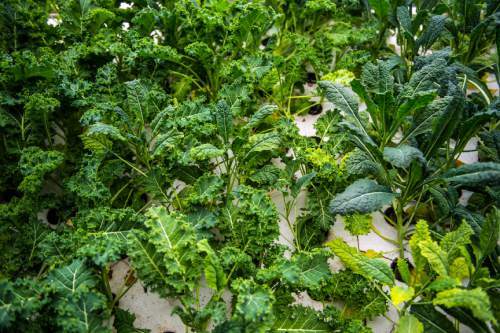 Chris Detrick | The Salt Lake Tribune Russian red kale and pak choi at Deseret Peak Aquaponics in Grantsville on Wednesday, Jan. 6, 2016. 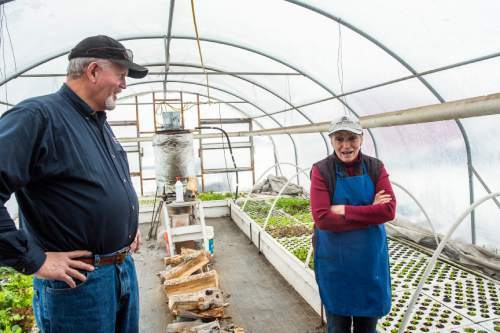 Chris Detrick | The Salt Lake Tribune Terry and Sandy Stapley look over some of their vegetables growing at Deseret Peak Aquaponics in Grantsville on Wednesday, Jan. 6, 2016. 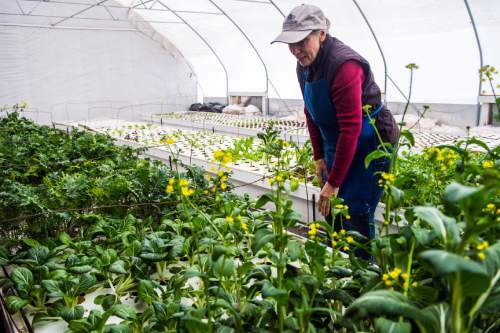 Granstville • The temperature outside says it is winter, but inside the Stapley greenhouse in Tooele County, it feels  and looks  like spring. Bursting from the floating garden beds are three varieties of kale, as well as bok choy, mustard greens, lettuces and cilantro. A large fish tank filled with rainbow trout sits in the corner and is the key to how this fresh produce is being grown. Terry and Sandy Stapley are using a farming technique called aquaponics, a method that has been around for centuries, but one that Utah and the rest of the nation may be seeing more of in the future. 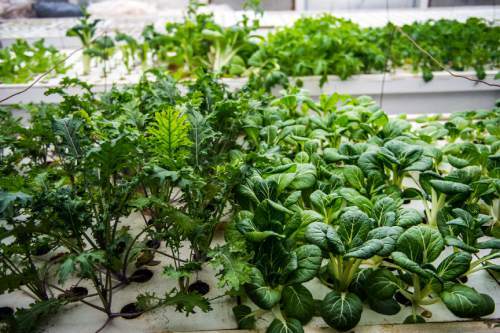 Experts say aquaponics produces more food with less land and water, two natural resources that will become scarce as Utah&apos;s population increases. For those who may wonder, aquaponics is an ecosystem where fish, plants and microbes work in symbiotic fashion. It starts with the fish, which naturally emit waste and ammonia into their tank. The excrement-laden water offers a complete fertilizer for the plants and is pumped into growing beds where naturally occurring, but beneficial, organisms break down the ammonia into nitrite and then nitrate, Terry Stapley explained during a recent visit. The plants absorb the nitrates, helping them grow and naturally filtering the water. By the time the water has made its way through the beds, it is clean and pumped back into the fish tank. At their Grantsville farm, where Deseret Peak Aquaponics is headquartered, the Stapleys use a raft-based system in which thick pieces of Styrofoam with holes float on top of the water that runs in low-lying troughs. Seedlings in small plastic baskets are placed inside each hole, their root systems dangling in the water below. With no restrictive dirt, and plenty of nutrients, the plants quickly form massive root systems that produce delicious vegetables and herbs, most of which the Stapleys sell at Salt Lake City&apos;s Winter Farmers Market at the Rio Grande. (See box for details.) The couple ­  who lived in Saratoga Springs before retiring and buying the Grantsville farm ­  eat the rest. While aquaponics is natural and sustainable, it isn&apos;t completely maintenance free. The Stapleys say they must add iron  a natural mineral  into the fish tank and pump oxygen into the water troughs so the plants and the fish have what they need. After those minor additions, however, "the fish provide everything else," said Sandy Stapley. "No weeding or daily watering." This time of year, the Stapleys also use a wood-fed rocket stove to keep the water in the fish tank and the temperature in the greenhouse amenable for growing and raising fish. "It looks intimidating," added Terry Stapley, "but it is so easy." The Stapleys, who also raise alpacas, goats and chickens, say aquaponics has the potential for a second source of income  the sale of farmed trout. After more than a year of aquaponic farming, they said that the fish, which started just a few inches long, have grown to be more than 13-14 inches in length and some weigh at least 1 pound. This fall, the fish also spawned and some of the larger fish had to be removed from the tank to keep the chemical balance in check, they said. 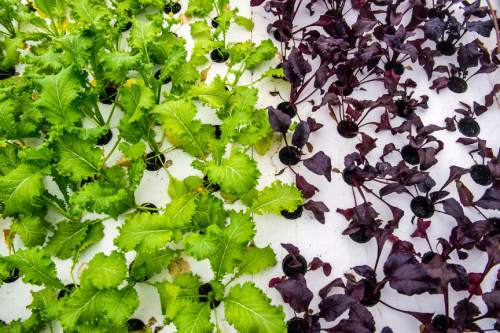 Mainstream farming • While aquaponics has been mostly experimental, it is moving into the mainstream as state, national and global resources diminish and backyard and commercial farmers look for new alternatives, said Jack Wilbur, with the Utah Department of Agriculture and Food. 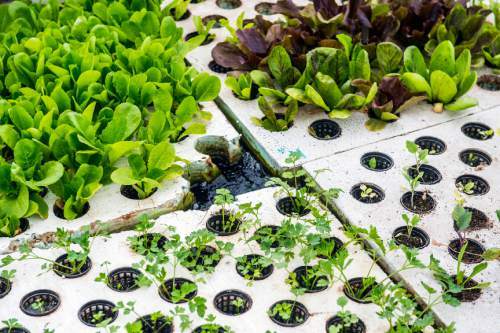 Agricultural studies show that aquaponics produces three to six times more vegetables and uses 70 percent to 90 percent less water than traditional dirt farming. While leafy greens and herbs are the most common crops in the winter; all types of vegetables can be grown in the summer, from tomatoes and squash to beets and corn. 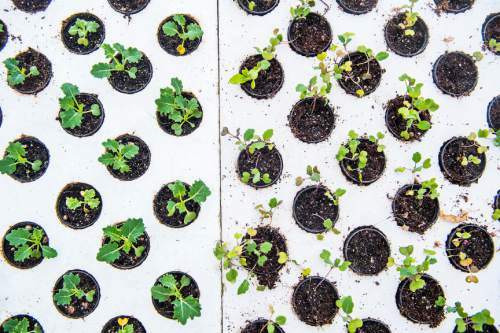 Hoping to educate Utahns about the method, the UDAF recently set up a demonstration garden in the lobby of its main office in Salt Lake City. It includes an aquaponics garden as well as a hydroponic system. The two are similar, but hydroponic plants grow in water without the fish fertilization. Interested gardeners can see both displays at the UDAF Offices, 350 N. Redwood Road, during regular business hours: Monday-Friday, 8 a.m. to 5 p.m. How-to information also is available on the department&apos;s website at http://www.ag.utah.gov . "We want people to know that anyone can do this, without a big investment," said Wilbur, who put together the gardens for about $100 each using PVC pipe, tubing, large plastic containers and a pump purchased at a local hardware store. He said the UDAF received a federal grant to help pay for the project. Wilbur said several species of fish do well in these recirculating aquaponic systems, including trout, koi and goldfish. The UDAF is using a striped bass hybrid thanks to a special permit from the Utah Division of Wildlife Resources (DWR). Tilapia is the most common species used across the country, as it can tolerate crowding and fluctuating temperatures. 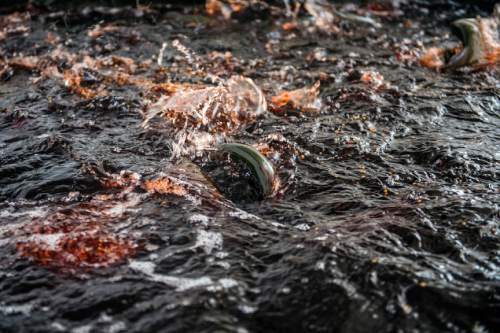 But the DWR has banned tilapia in Utah as it is an invasive species that, if released accidentally into the waterways, could harm the native fish, Wilbur said. Commercial applications • A larger demonstration garden also is being constructed at the Progressive Plants Wholesale Nursery in Copperton. It&apos;s a joint project with Orem-based company NaturePonics, the makers of bamboo vertical gardening systems. "We are weeks away from our first planting," NaturePonics founder Daniel Wagner said of the company&apos;s expansion into aquaponics. "The industry has really blossomed in Australia and is making its way through the states. 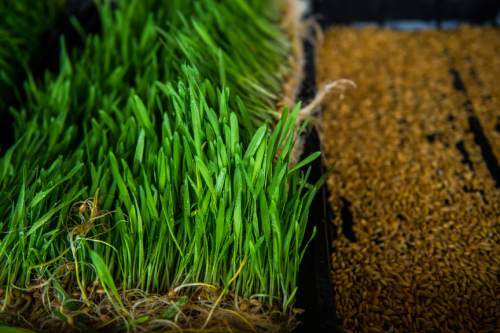 It&apos;s a major solution to our farming needs in the future and water shortages." 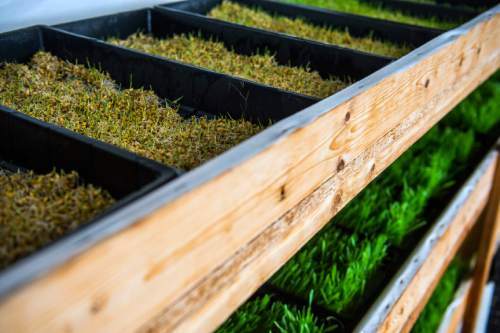 His company, which will focus on systems mostly for commercial farmers, is building a vertical system in Copperton that can grow 100,000 plants in 10,000 square feet of space. Besides showing farmers what is possible, the produce and fish that are grown at the NaturePonics display will be sold to area restaurants, Wagner said. "You really can produce an enormous amount of food in a small amount of space." Sandy and Terry Stapley, owners of Deseret Peak Aquaponics, sell their produce at Salt Lake City&apos;s Winter Farmers Market. When • Alternating Saturdays from 10 a.m. to 2 p.m. through April 23. The next market is Saturday, Jan. 16.